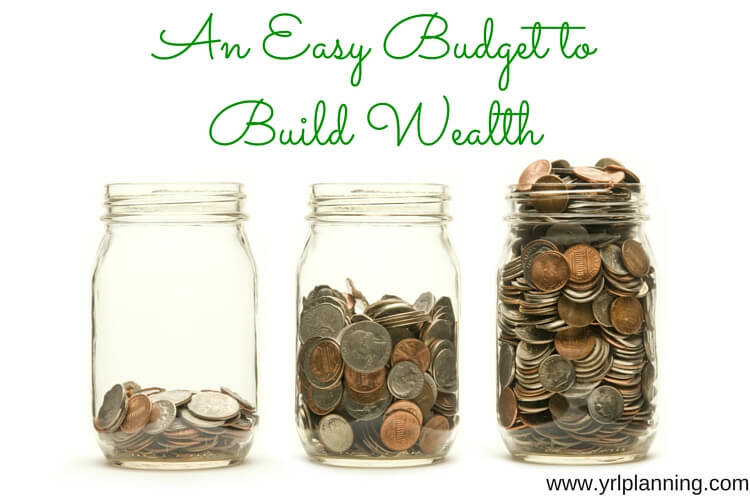 We all know what we have to do to build wealth: spend less and save more. But it can be tough to know what to do on a daily basis to build wealth. It’s fine to have take-out sometimes, but can you afford take-out tonight? Or do you need to save the money for something else? A budget can help you stay on track. A budget can help you make wise spending decisions, but most of us find living by a budget and tracking expenses to be a tedious task. But it doesn’t have to be. An easy budget can help you keep an eye on your expenses without worrying about every last penny. Fixed Spending: This is your mortgage or rent, electricity bill, student loans, car payment, and so on. It’s the stuff you have to pay every month, and it’s usually about the same amount. Variable Spending: This is the stuff that varies every month. You have to buy groceries and you’d like to eat out, but you could buy 10 cents Ramen or fancy steaks. This includes groceries, dining out, household spending, and fun money. Save to Spend Savings: This is the category that those who often struggle with budgeting forget to include. This is the lumpy, necessary expenses like car insurance, but it also includes fun things like your yearly summer vacation and your annual Christmas gift spending. Save a little each month towards these larger expenses, and you’ll have the money there when you need it. Long Term Wealth Building Savings: This is your emergency fund, college savings, and retirement savings. It’s the stuff that your older self will need. Your goal is to take your monthly income and allocate the right amount in each bucket. When you determine your fixed spending, save-to-spend savings, and long term wealth building savings, you’ll be left the amount you can allocate towards your variable expenses. This makes staying on track with your spending easy. As long as your variable spending is in line with your target, you’ll be building wealth. To make this system easy to implement, use one debit card or credit card for all your variable spending to keep an eye on your spending every month. You can also automate your savings with an auto-draft or by upping your 401(k) withdrawals to make your easy budget even simpler. If the money never hits your bank account, you’ll be less tempted to spend the money you hope to save. Now that you know your monthly variable expenses, you can focus on spending less and saving more over time. Pick one small action to help you reduce your expenses. Perhaps you’ll choose to concentrate on eating breakfast at home instead of grabbing something on the way to work. You can even keep the latte but drop the breakfast sandwich, and still save money. By implementing one small spending change after another, you’ll be able to save more and more for your long term goals. You can put some towards your older self by saving for retirement, but you can also put some towards a fun goal like saving for a dream vacation. If you want to improve your finances but find it difficult to track your expenses regularly, you can still improve your finances. With the right system, it’s much easier to stay on track with your saving and spending goals.